If you ship internationally at all, it’s important to understand how customs works and what declaring items means when you are shipping a package. 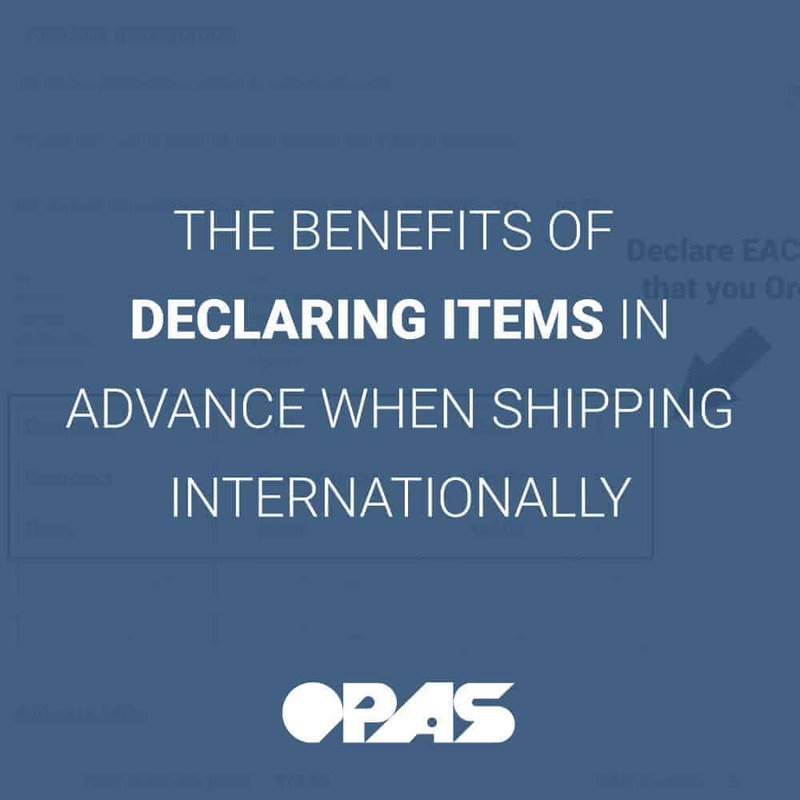 When shipping with OPAS there are benefits to declaring your items with us in advance, one major benefit being the time saved. In this post, we’ll dive into what it means to declare an item, the benefits of doing it in advance, how to do it, and finally, a few tips to help the process. Once you’ve declared the value of your items through your account on My.OPAS.com, our team handles the rest so that you don’t have to go through customs or worry about the duties process. * All you need to do is simply add your purchase details into your account (we’ll dive into this process later in this post). What does it Mean to Declare Something? Declaring items means providing customs with the price that you paid for the item so that they can appropriately calculate your cost in duties/taxes. Customs regulations and the tax placed can differ between countries. When you are declaring items in advance, it helps our team process your order much quicker which saves a significant amount of time when shipping. This simple task makes it so we can get your consolidated package out the door faster which in turn gets the product into your hands more quickly. Another great benefit of declaring in advance is that you’ll be able to see what items have arrived at our warehouse. Sometimes when partial delivery occurs (this is when you have multiple items, and only some of the products are delivered), you need to know which items have arrived so you can determine if you want to ship or wait for your other items. If you declare each piece in our system, we’ll be able to let you know which things are here and which are not. Now that you know how declaring in advance can benefit you, in the long run, we’ll review how to do it. The process is super simple and can be completed in just a few steps. 3 | Declare each individual item by categories, price per unit, and quantity. Once you’ve inputted details for all your items double check that the total purchase price and total quantity are correct and click “Submit”. Our “Import from Amazon” button is handy when you are ordering multiple items from Amazon.com. By uploading a spreadsheet, you can skip entering each item individually, and everything will be automatically uploaded. We’ve created a tutorial video if you need assistance exporting the file from Amazon. As one of our benefits in the section above mentions a significant advantage of declaring your items before they arrive in our warehouse is that you can see the status of the item. From “My Mailbox” you can hover over the numbers listed under the status column which allows you to see if the order has been received, details have been entered, and if it’s ready for you to request shipment. By hovering over the “Edit” button under the “Order Info” column you can see exactly which items you declared are inside of that package by name. That wraps up everything you need to know about declaring products in advance. If any questions come up during the process always feel free to reach out to our customer service team. They can be contacted via phone or email at service@opas.com. When shipping kits and product sets overseas customs usually requires our team to declare each item in the kit individually. By declaring in advance, our team can process everything quickly because we’ll know exactly what to expect upon arrival and can input the prices correctly. Customs requires that you must declare every item that is purchased, so they won’t allow users to declare an item at zero dollars. If the item is a gift, replacement, return, or a free sample you must still put in a reasonable market value price, and you can add a note saying “No commercial value” in the second field along with what the item is. We hope you found this information on declaring items helpful. If done correctly and in advance, it can shorten the shipping processing time and make things run smoothly for our team, customs, and you. It will also make it easy to organize your shipments by monitoring the status of your purchases. Again, if you have any questions at all during the process of declaring our customer service team is always happy to help. Get in touch by both phone and email here. *Note: Any additional fees that customs places will be forwarded to the customer.